NOTES: Short run with resin parts. Injected canopy. Late in 1945, BuAer began discussing with Curtiss, Douglas, Fleetwings, and Grumman the requirement for a jet powered two seat carrier borne night fighter. It was expected that it be able to detect aircraft flying at 500mph and 40,000 feet from a distance of 125 miles (no mean feat in those days). Both Douglas and Grumman were awarded contracts. Douglas for the XF3D and Grumman for the XF9F (which evolved into a single seat day fighter). This left Douglas to develop the world's first carrier borne jet night fighter. Douglas' Ed Heinemann decided to produce a conservative design with two Westinghouse J-34 turbojets placed against the large fuselage (large for all the needed fuel). The crew were placed side by side in fixed seats. A crew escape tunnel that led down between the engine nacelles was developed and later used on the large A3D Skywarrior. The Skyknight was a large and very heavy aircraft for the time. It had an armament of four nose mounted 20mm cannon and used an APQ-35 search and targeting radar. First flight was in March 1948 and the three prototypes proved to be rather vice-free. A Navy production order for 28 F3D-1 had been placed in June of 1948 and though the Air Force was interested, it wasn't interested enough. There then began a sequence of different F3D airframes with changes in them for various missions, such as a Sparrow missile aircraft, or an electronics warfare platform, or trainers. The greatest use of the F3D were the F3D-2 variants. These were put to use by the USMC in the second half of the Korean War as night fighters. Here, their overall gloss sea blue was painted over with a matte black that was thought to be a better color for night fighting. 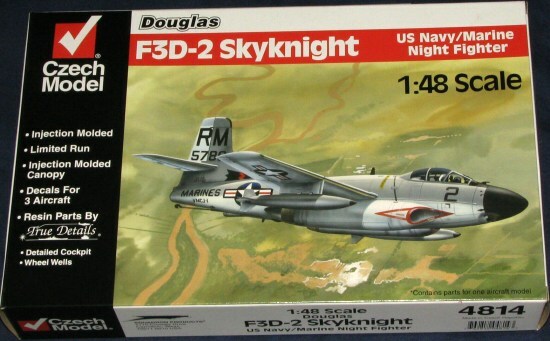 The Navy operated the Skyknight in several squadrons, though with the speed of aircraft development, their active carrier borne life was rather short. The longest use of the F3D was as a crew trainer, test platform, and as an electronic warfare platform, the latter being basically a USMC operation. In 1962, all F3Ds were redesignated F-10s and it was with this designation that the aircraft served with the Corps until 1970 when the last EF-10B was retired. Several continued on in various test programs until the 1980s when it was obvious that the planes were uneconomical to keep flying. Several are located in various museums around the US. After a long wait and a few delays, the long awaited Czech Model Skyknight has arrived. Eagerly tearing into the box, I was greeted (hi there) by a large bag full of injected plastic parts, a bubble bag with all the resin bits (good idea as nothing was broken), and a huge decal sheet. This is a modern short run kit. No reliance on photo etched parts, quality resin detail bits, injected parts with excellent surface detailing and injected plastic clear parts that you can easily see through. However, it is a short run kit and that means a few things as well. One is that there will be injector pin towers on the inside of the large bits, such as the wings, fuselage and so on. These are all easily removed and anyone who has built a short run kit of any scale will be used to doing so. There are also relatively large sprue gates and these gates often merge in with the part, requiring extra clean up. Where there are parts that have broken free, there are little 'bites' taken out of the plastic. Again, normal for short run. There is also a small amount of flash on most of the parts that will need clean up as in all short run endeavors. The only thing I could call a glitch is that on two of my drop tank halves where the separate fins slot in place, these slots are partially filled with plastic. 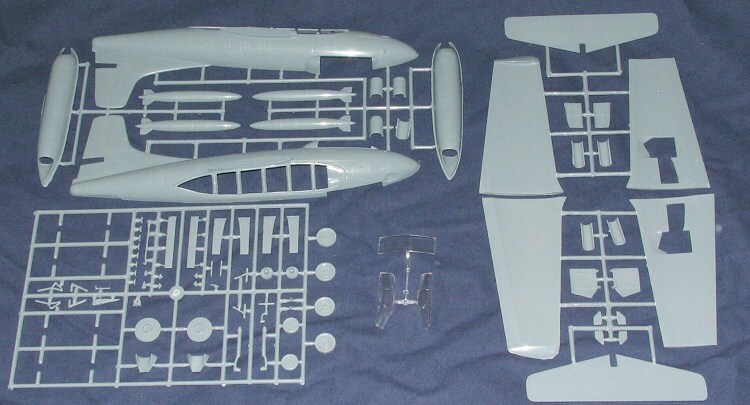 The kit provides a really super set of resin that includes the cockpit, sidewalls, seat, stick and instrument panel. 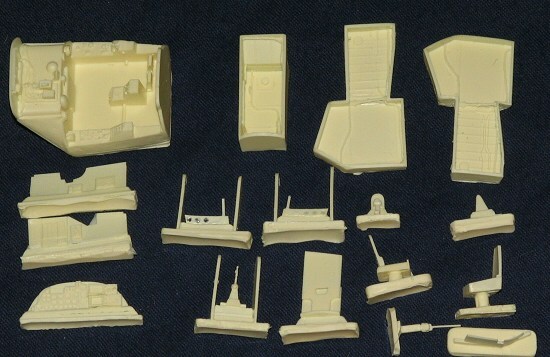 There is also resin for the main and nose wheel wells and a few other smaller bits. I gave one of the main gear wells a test fit onto the inside of one wing and the fit leaves something to be desired. Some adjustment will be needed for a good fit. The large resin parts have the pour stubs rounded off, but these stubs still need to be removed for them to fit. The instructions are well done on a large, folded sheet. Page 1 is a short history and a parts layout. Pages 2 and 3 contain the 11 well drawn construction steps. Color info and hits are provided in each step as needed. There are not really any optional bits as the Skyknight's thirsty engines required the plane to carry two drop ta nks at all times. Markings are provided for three of the more common color schemes carried by this aircraft during its lifetime. Things all started out in overall gloss sea blue and a VF-14 aircraf from the USS Intrepid circa 1954 is supplied. For the matte black scheme used by Korean War Marines, we have a VMF(N)-513 aircraft, and finally, in the last years of its life, a USMC EF-10B from VMCJ-1 as based in Vietnam during 1967 in light gull grey over white. Interestingly, the cockpit of these planes were repainted from Interior Green to Dark Gull Grey when they went to the final color scheme. Most unusual as cockpits are rarely repainted when the aircraft is overhauled. 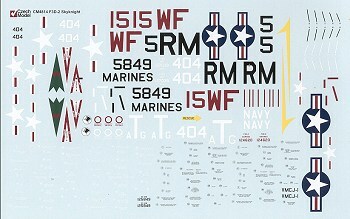 The huge decal sheet is superbly printed and has tons of data markings in both white and black. In addition to the decal placement guide in the instructions, there are color profiles on the back of the box. I'd be quite surprised if there wasn't an aftermarket sheet for this kit produced as these planes also served with training squadrons in the very colorful white and international orange scheme. You already know how excited I am about this kit. I've been waiting for a good Skyknight for what seems to be decades and was never able to find one of the old Allyn kits to work with. It is a kit that is only for experienced modelers because of its nature, but if you were ever wanting to try a short run kit, this one would be a good one as a first go. I've already started on the build process so you should see a full build review here in the very near future. McDonnell-Douglas Aircraft since 1920, volume 1, by Rene J Francillon, 1988, Naval Institute Press.